Well guys, my garden was put behind schedule due to a naughty bull jumping the fence and trampling everything. But it was all replanted quickly and has rebounded, albeit later in the season. C’mon in and take a look! Our favorite fresh veggie to enjoy is green beans. So I planted a row of heirloom green beans, and a week or two later planted another. And another. PLUS another! The premise is that by the time the first row of beans is petering out, the others will be in production. And it’s worked great! RancherMan & I have enjoyed fresh green beans with almost every meal. I’m not sure we can get tired of them but if we do they’ll be blanched and thrown in the freezer. Let me tell ya, there’s not much more delight than green beans fresh from the garden that are cooked to tendercrisp instead of what usually comes in a can, which is way overcooked for my tastes. But what about the rest of the garden. Well, my spaghetti squash is really taking off. Of course I started early looking for the dreaded Squash Bug Eggs. I was told that if I wait until later in the season I wouldn’t have to deal with them much. But I’ve found that information to be flawed. They’re every bit as present as if I’d planted in early spring. 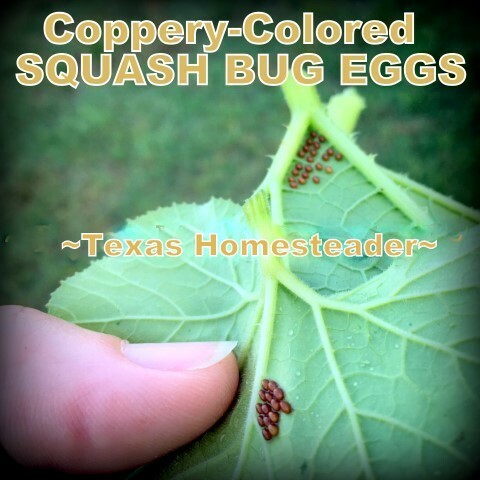 So I deal with Squash Bugs the way I always do and I’ve not had much more trouble with them. I know spaghetti squashes take longer to mature than summer squash or zucchini, but they also last much longer in storage. So although I’m assured of having plenty of spaghetti squash for RancherMan & me, I’ll also have plenty to share in my weekly blessing basket too. My tomatoes are growing like crazy but so far no fresh tomatoes. Hopefully I get something before summer temps keep the fruit from setting. I planted heirloom Mariglobes this year & I’m much anticipating that burst of fresh tomato flavor. The onions & garlic have been rocking it! My walking onions have already put on their walking shoes and are providing me with next year’s harvest too. How much I love that I don’t have to replant my onions every year, they replant themselves! The peppers are all doing fine, but not much to harvest yet. I’ve seen a couple of tiny poblanos but no red bells nor anaheims. I know they’re usually lpretty good about producing during summer months so I’m still anticipating that. I purposely plante dthos poblanos so I could provide RancherMan with one of his favorite dishes – lazy-cook’s Chile Relleno. So c’mon….PEPPERS! The concord grapevine is loaded with immature grapes. Now last year I had quite the crop too, but a mischievous group of raccoons came in night after night and ate every stinkin’ one as they ripened! So RancherMan set a trap next to the grapevines. He’s also considering setting up a low hotwire to keep them completely away from the grapevines. I’m thinking I may try to net the grapevine as well, although that will almost guarantee destruction of the net. Those grapevines grow several inches every day! We’ll see if I get a crop this year, fingers crossed. Other than that, not much harvest from the garden yet. The corn I planted is struggling and the cantaloupe & watermelon are growing well but no fruit yet. The herbs are all growing fantastic though! I’m harvesting fresh stevia almost every day and using it when making RancherMan’s sweetened sun tea. He loves it! And the thyme is looking really good, as is the sage, basil and oregano. All growing like crazy! So yeah, I’ve got things going on in the garden but the only thing I’m harvesting consistenly yet is green beans. How’s your garden going? 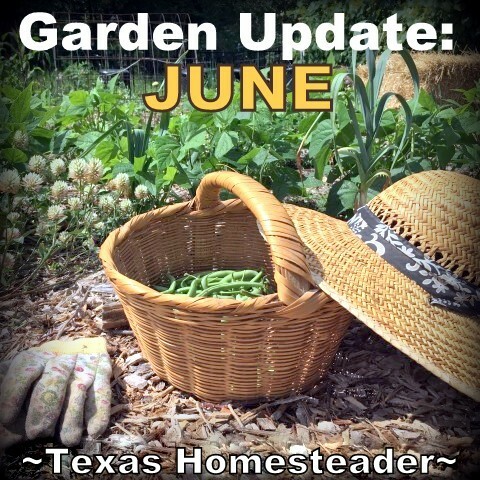 This entry was posted in Blog Posts and tagged Gardening on June 21, 2018 by Texas Homesteader. 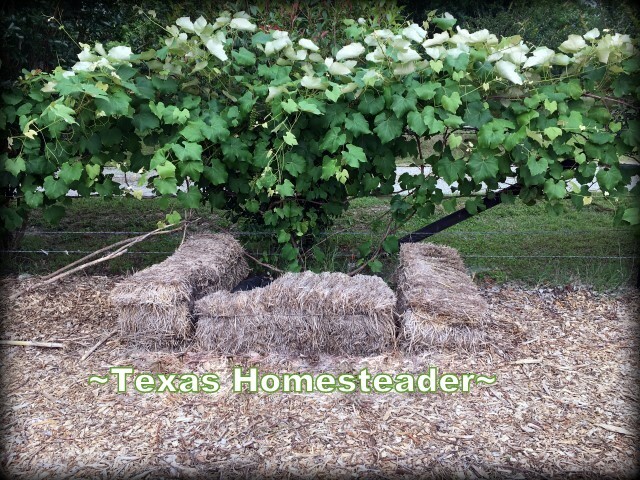 Your garden sounds amazing! But I’m really intrigued by the stevia- do you just throw fresh leaves into the tea? & do you dry it for winter use? Have I missed a post about it? I planted my squash late this year hoping to miss some of the bugs, but have had squash beetles already. I have heard that icicle radishes repel one type of bug, but I can’t remember which. I did plant the icicle radishes and still have the beetles. I had read that you need to plant after July 4th to miss the bugs, but I went ahead and planted because I didn’t think I would have enough time to get a crop of winter squash. We had broccoli, cabbage, and turnips earlier but they are gone and are replaced with tomatoes, carrots, squash and green beans. They are all growing well, but will be a few more weeks before we get produce. I didn’t plant potatoes this year, but have 4 plants of volunteers so letting they grow amount the carrots. My bull got into our freshly tilled garden this spring. Nice bull divot, but no true damage, just frustration and time to retill. Glad yours has come back so nicely. Here in Michigan I am not harvesting anything yet. I only planted tomatoes, bell peppers, jalapenos, cukes, zucchini, brussel sprouts and broccoli this year. The tomatoes are starting to produce but the fruit is small right now. My peppers really struggled this year so I have been spraying them with epsom salt and water, which has seemed to help them perk up. Looks like cukes and zucchini are getting ready to flower. I found cucumber beetles though so I have started an organic 3 and 1 treatment. I hope it works. I haven’t had cukes and zucchini in a couple years now due to these pests. If I can’t control them this year I will have to take more drastic measures and introduce chemicals to my garden which I do not want to do. Any suggestions on how to rid my garden of these pests organically?